Candle magic is a popular way of spell-casting and is one way of carrying out a working. 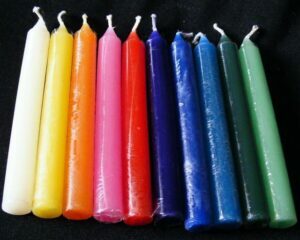 Clearly you will need to have a good selectionof candles of different colours as you use particular colours for each type of working. You can use dinner candles or for the impatient there are small spell candles that will burn down quicker. The following is a list of colour correspondences. This is neither definitive nor cast in stone. If you feel a particular colour would work better for you for a particular purpose then go with it. Remember that everything you use is there to help you to focus on what you are doing. Magenta – quick changes. You can use this with any other candle to speed things up. Call up your circle as usual. Once you have chosen the candle for the purpose you then anoint or dress the candle. This is done by rubbing oil (preferably essential oil) into the candle. Again the choice of the oil is the one relevant to the purpose. Also be careful to only use essential oils diluted in a carrier to avoid problems getting the pure oil on your hands. If you want to draw something to you rub the oil from the top to the middle and then the bottom to the middle. If you are wanting to push something away from you oil the reverse way from the middle to the ends. While doing this you are adding your intent to the energy within the candle and increasing the focus on the end result. Then you state your purpose over the candle saying something like ‘In the name of the God and Goddess I cleanse and consecrate this taper may it burn with strength and brightly in service of the light’. To formulate your wording you can write it down on a clean piece of paper either in English or in one of the magical or angel alphabets. You can also carve your request into the candle using the same directions as anointing the candle. Then fold up the paper and visualise as strongly as possible the end product you are seeking. Light your candle and then, if you are usual a paper, set fire to it in the flame of the candle. ALWAYS BE CAREFUL WHEN USING CANDLES THAT YOU USE FIRE SAFELY! If you have a fireproof cauldron drop the paper into the cauldron otherwise make sure you have something fireproof to receive the paper. Once you have completed the process allow the candle to burn right down. Never reuse the candle for another purpose as you have programmed it for a single task. One other matter to consider is when to perform your spell. There are specific days and even times of day and, of course, moon phases when it is considered the optimum time for particular purposes. However, I always feel that if the need is great and you would have to wait another month (as you could if you have just missed the ‘right’ time) then carry on and do the spell anyway it may be a little less effective but that is probably better than doing nothing for a month while you wait. Just go with your own intuition or gut feeling. Again the following list is not exhaustive but will give you the basics. Sunday – (ruled by the Sun) banishing evil, exorcism, healing, prosperity.